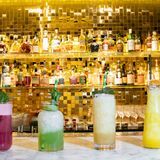 "Set behind the façade of a boutique tea counter and a secret golden hand-shaped handle is Blind Spot at St Martins Lane, a late-night speakeasy that offers guests bespoke and signature cocktails bursting with flavours influenced by the British Empire and its ancient tea trade. Blind Spot cocktail bar travels from harbour to harbour and gathers the world flavours into its new menu. From NYC to Sydney, through Venice, Mumbai, Osaka and many more. Spin the globe and choose from our selection of 25 destinations. Pair the carefully crafted drinks with nibbles from the same regions, and let us transport you to exotic places. 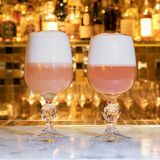 The Speakeasy Cocktail Tea is perfect for all cake and cocktail lovers. Indulge in savoury delights from quiche Lorraine to mini brioche buns frilled with crayfish before treating those taste buds to the sweet selection of passion fruit macaroons to a dulce panna cotta with blackberry compote. To top off your Speakeasy Cocktail Tea, enjoy our flight of tea-infused cocktails. The bar is brought to life throughout the week with a programme of live music and events. 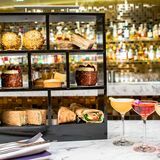 Kick the week off in style with Manhattan Mondays, where beginners and cocktail connoisseurs alike can utilise the custom-made Manhattan ordering system to individualise and innovate the well-loved classic. On Tuesdays Live Spot showcases some of London’s hottest Jazz and Swing acts, heading into mid-week with up tempo electronic and dance DJ residencies Wednesdays, Fridays and Saturdays lasting until the early hours. 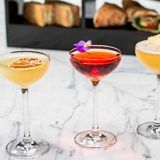 The Clumsies (25-28 Sept): This September, The Clumsies, who have been featured in the Top 10 of the World’s Best Bars, will be bringing their award-winning serves to Blind Spot. Join us in our elusive speakeasy for the opportunity to sample a selection of the most delicious cocktails, including The Clumsy Martini." By sending this booking your details will only be sent to Blind Spot and will never be shared with other third parties. By clicking this box you agree to the Terms and Conditions set out above. You can book to reserve an area of Blind Spot for you and your friends. Just enter your requirements below to see what they have to offer. The wife and I popped in for a cocktail last week after visiting Asia De Cuba - really impressive drinks selection and a really cool vibe. Lots of very glamorous looking folk - but everyone people seemed pretty chilled out and there wasn't too much pretentiousness.